First, I want to thank everyone that participated in the call to action to oppose this legislation. Unfortunately, and despite our best efforts, President Trump signed the FAA Reauthorization Act of 2018 (“2018 Act”) into law on Oct 5, 2018. Sad news to be sure, yet according to AMA, our voices were heard loud and clear and AMA is still in negotiations with the FAA as it pertains to certain provisions of the 2018 Act. How is the 2018 Act different than the legislation that was passed in 2012 (i.e. the “FAA Modernization and Reform Act of 2012)? Primarily, as it pertains to modelers and hobbyists, the 2018 Act no longer has a “Special Rule for Model Aircraft” (formerly referred to as Section 336). There are, however, several provisions in the 2018 Act relating to our hobby that were championed by our government affairs team at AMA. Some of these provisions require continued dialogue and coordination with the FAA. The provisions, in the 2018 Act, which primarily impact our hobby are contained in Section 349 (please see attached). One of the most impactful provisions of Section 349 is the rule limiting operation of aircraft to no more than 400 feet above ground level. Fortunately, according to AMA, there are NO changes that AMA members need to follow immediately. AMA is telling its members that we should continue to fly in accordance with AMA’s safety guidelines and local club rules, and that existing agreements between AMA clubs and the FAA should continue to be followed. I would add that neither AAM nor the City of Arvada are in a position or inclined (in any way) to enforce FAA regulations at this time. The most important take-a-way from all of this is that, for now, we are operating under the same set of AMA guidelines and Club rules that have always been in place. 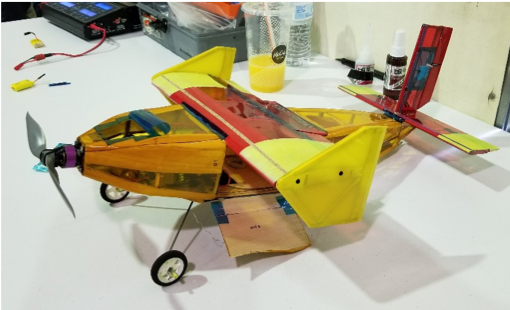 Of utmost importance to our future, is the continued safe operation of model aircraft according current AMA and Club rules as AMA continues to work cooperatively and diligently with FAA’s leadership in Washington to address the issues that impact our hobby. Lastly, the end of the year is quickly approaching. I would like to encourage everyone, especially those of you who have calendar year renewals, to get your AAM and AMA memberships renewed soon. 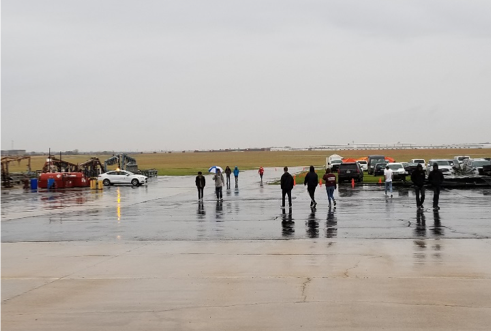 The 2018 DBF fly-off was completed last weekend (Apr 19-22) in Wichita, KS. 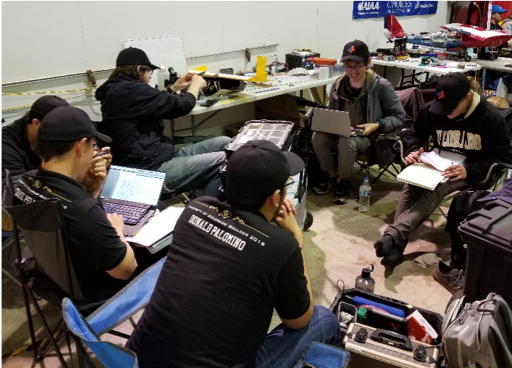 Two (2) Colorado teams competed and finished very, very well – University of Colorado (CU) and the CO School of Mines (CSM). Both teams completed all required missions and both were in the top 25 out of 90! CU finished 13th and CSM finished 22nd! One of the biggest accomplishments you can achieve, beyond just showing up and competing (because that in-and-of itself can be a daunting task when you have to travel half way around the world), is completing all the required missions. And, that does not guarantee you a top 10 finish. I estimate that less than 20% of all 90 teams completed all required missions (1-ground + 3-flight). Many, many teams never even got off the ground. When you see some of the contraptions that showed up at DBF, you wonder… what were they thinking? 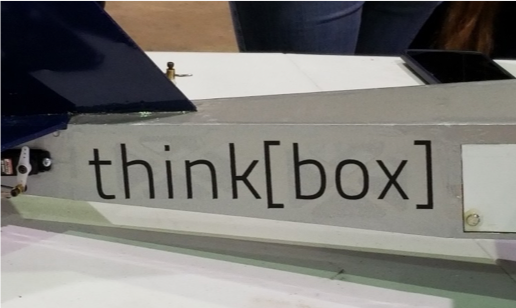 Nevertheless, you have to remember that this competition is about innovation and thinking outside the box. DBF is sort of like a fun fly, except the scoring is very complex and specific to each of the missions. There is a little luck involved, there are timed events, and a duration event with heavier payload. 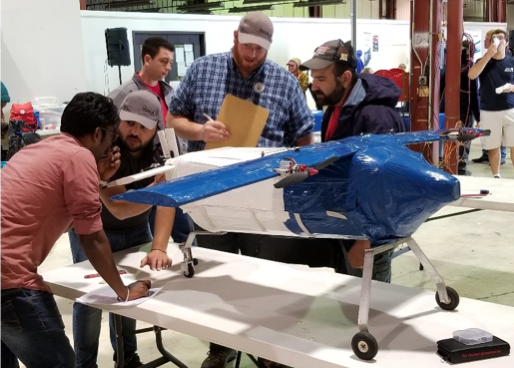 DBF challenges teams to come up with a design that will be versatile enough for the entire rigor of the fly-off. For the ground event, teams rolled diced to determine the challenges. 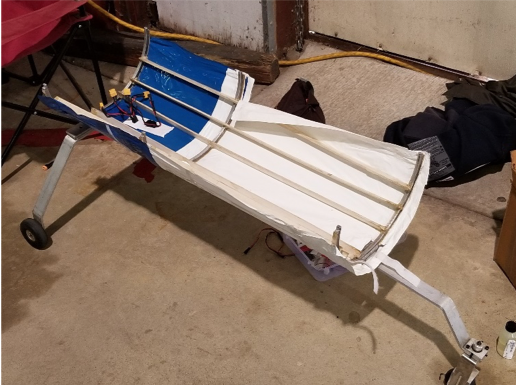 Among the challenges were removing/replacing the Rx, removing/replacing the rudder, prop, etc. A score was awarded only if you were able to do these tasks within the allotted time. The first flying mission was an empty plane for 3 laps around the field within 5 minutes (piece of cake). The second flying mission was with passengers (i.e. rubber “bouncy” balls). The teams would choose the number of balls, but the size varied, again, by a roll of the dice. Then fly the same 3 laps in the shortest amount of time, without any balls coming loose from their restraints in the fuselage. The third and last mission was flown with passengers and payload (i.e. extra weight), the heavier the better. Then fly as many laps as you can within a maximum limit of 10 minutes. All flying missions had to end with a successful landing on the runway. 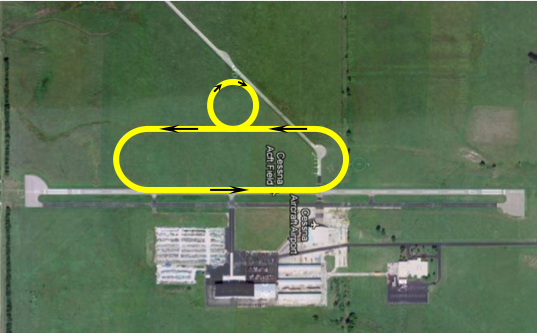 Cessna’s runway is several thousand feet long, but only about 35 feet wide. Planes were also weighed after each flying mission to help determine the final score. 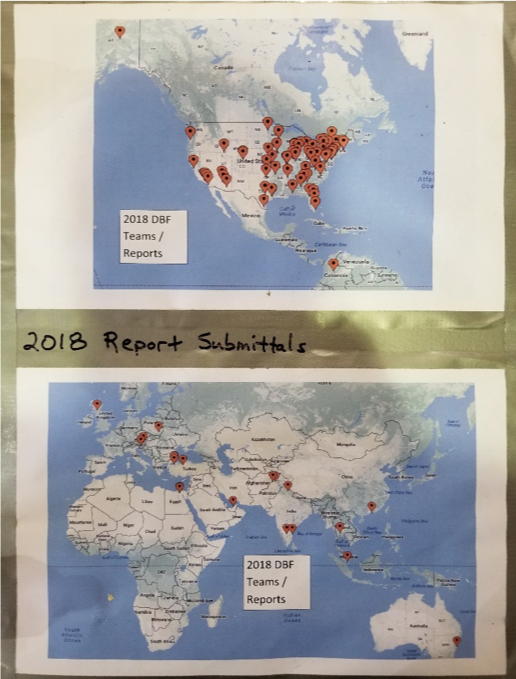 Extra attempts at missions 2 and 3 were allowed to improve scores, but not many teams would be in a position to complete 3 missions let alone any extra attempts. I found out later that some teams had their own goals. For instance, I was informed that Stanford’s goal was to win missions 2 and 3 by carrying the most passengers and payload for the longest time. The geometry of their plane (i.e. long wingspan and heavy weight) eliminated them from winning DBF. There was no doubt in my mind that there was a contest within a contest going on! However, it was also obvious that in order to contend to win DBF, you had to have a very light plane with short wingspan. Thus, some very small planes were built. So small, was the plane from Clarkson University, that I could not see it at the far ends of each lap (500’ north and south of center field). Simply put, I could not have flown that plane because my eyes are not good enough anymore. USC’s pilot admitted to the same affliction flying their tiny plane (i.e. less than 11” span). Small planes in low visibility are a bad combination! That proved to be an added challenge for the test pilots at DBF this year. As I mentioned in the previous update, CU’s plane was the 3rd generation, and many things improved along the way including construction quality and precision. CSM’s plane was a bit more crude, but more conventional in design, so it ended up being the easier plane to fly. Also, based on the aforementioned, less competitive in terms of mission scoring due to its size, but a success design nonetheless. CSM had not asked for help from either Dan, myself or AAM prior to the competition. A situation I hope to rectify in the future. However, I did end up flying for both teams even though CSM already had a student pilot. He was inexperienced and had never flown is high wind or attempted a crosswind landing. As it would turn out, I not only flew for CU and CSM, but also for UCLA, Cornell (for the 2nd time in 2 years), Rutgers, Notre Dame and a university from Istanbul, Turkey. Needless to say, I was a busy test pilot. CSM had a rough start. On their way out of town, Thursday morning at 3 am, they hit a deer on Hwy 58. 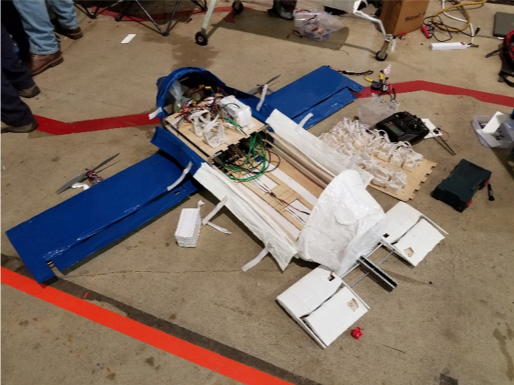 No one was injured (except the deer), but it caused them to miss tech inspection that day, which cascaded into missing their first flight que (i.e. opportunity to fly) on Friday. 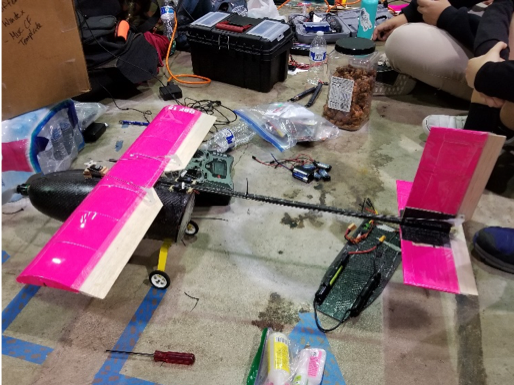 Missing flight ques is a bad thing because you don’t get another chance until all other teams have gone through the que, and that takes a lot of time when there are 90 teams competing. The flight order is set based on your report score. 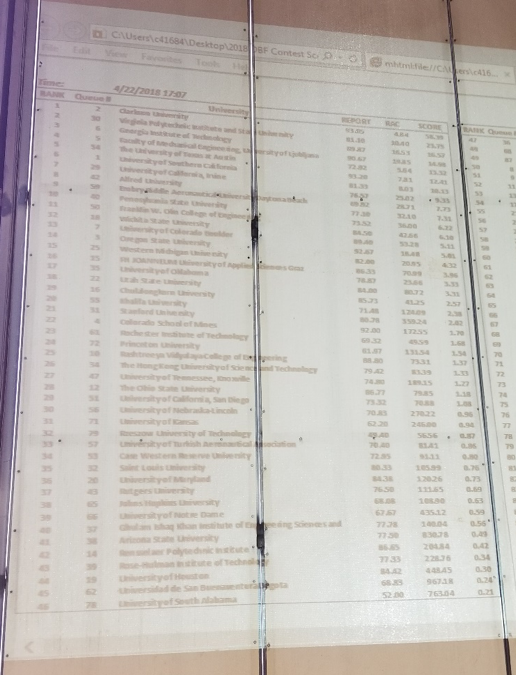 CSM and CU were 4th and 7th, respectively, with their reports. Anything in the top 10 is impressive and both schools have historically done very well. This is particularly impressive for CSM despite the obvious disadvantage of NOT having an aero-engineering program. 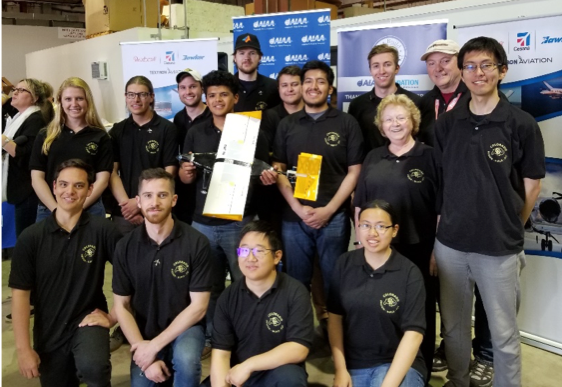 CU did get their tech inspection on Thursday and we flew a successful 1st mission early Friday morning when the winds were calmer. Thus, CSM was immediately behind the 8-ball to get in all required missions over the weekend. Plus, there was a new wrinkle this year. The ground mission had to be opted for in place of a flight mission. That rule ended being changed on Saturday during the rain delay, but it still impacted CSM negatively because they opted to do the ground mission late Friday afternoon instead of flying when they came up in the que for the 2nd time. They did that partly because of severe crosswind conditions. The thinking (at the time) was that they’d still get in 3 flights attempts between Saturday and Sunday. So after Friday, CU had successfully completed its ground and 1st flying missions while CSM had only completed its ground mission. Then the rain came early Saturday morning. As they did 2 years earlier, the organizers tried to wait out the rain based on the promise of improved conditions (by mid-morning) in the forecast. However, the weather never broke and it rained all day. It was a cold, wet, windy, miserable day! And, not only did we lose 2 ½ hours in the morning, but they suspended flying 2 hours early at the end of the day. 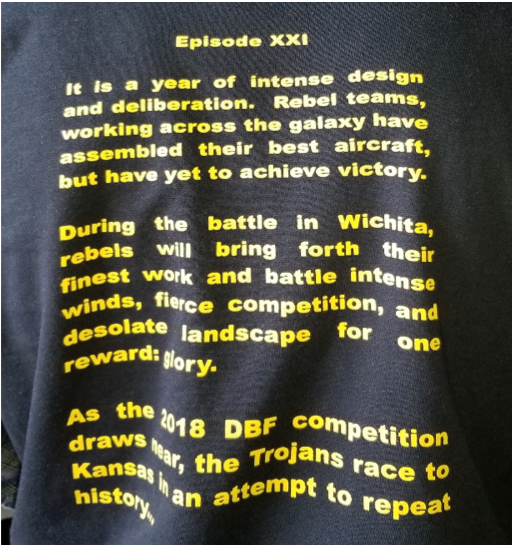 Thus, they barely got through the flight order 1 complete revolution. Both CU and CSM flew successfully, but only the 1 time. So after Saturday, CU was sitting comfortably with 1 mission remaining and CSM nervous about getting 2 flight missions in on Sunday. The rain departed on Sunday, but the wind remained. Fortunately, it was due north and right down the runway. Unfortunately, it was 15-20 gusting to 20-30 mph and, at times, very bumpy. CU was busy strategizing how to fly based on the prospect of a possible 2nd attempt at mission 3. Meanwhile, CSM was crossing their fingers that they’d get the 2 chances needed to complete all 3 missions. With CSM and CU both early in the order (at 4th and 7th), their prospects for 2 flights each were pretty good, but not guaranteed. CSM came up (for the 1st time) and flew a successful mission 2. Now it was CU’s turn. A successful mission 3 would be the best result for CU in many years and everyone was excited. Mission 3 was all about duration. Their strategy was to complete 3 laps on this attempt. Then, if a 2nd attempt could be made, run the plane out of batteries (for as many laps as possible) and hope to get back to the runway. The 3 laps were easily completed, but I just missed the runway on the landing, DQ’ing the attempt. A nasty gust pushed the plane to the edge of the runway and it bounced off. It was a crushing outcome, and to add insult to injury, the plane sustained minor damage. Fortunately, repairs were not going to be the issue. The team would have ample time to repair/replace broken parts. The question was whether CU would get another chance to complete mission 3. CU now found itself in the same boat as CSM… hoping for the flight order to circle around 1 more time to provide another attempt at mission 3. The first flights for both teams had occurred shortly before noon. Therefore, the flight order needed to circle all the way around in just under 5 hours (i.e. before the 5 pm deadline). On the plus side, there is a lot of attrition by Sunday afternoon (i.e. 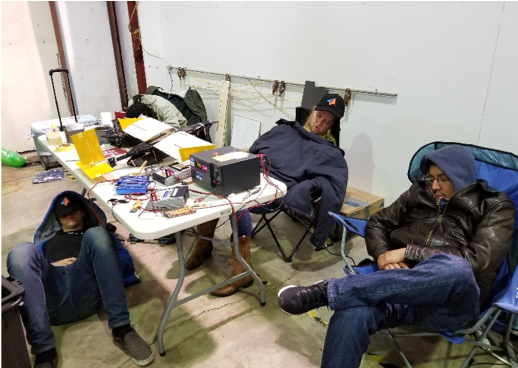 many teams have crashed out). Very few actually thrown in the towel. However, many would miss their que by not having repairs completed in time to fly. So the waiting game began. The one thing we knew for sure was that all the top teams (i.e. everyone ahead of CU and CSM) would be ready to take their turns at either mission 3 or for an extra attempt (at missions 2 or 3). Also on the negative side, many teams would be attempting mission 3, which meant up to 10 minutes per flight. As was the case with Notre Dame at #80. I flew for them late in the afternoon (around 4:30 pm). They wanted me to fly 8 minutes, and then more if I thought the batteries would hold up. However, after 4 laps the batteries felt very weak and the team agreed to let me land. Subliminally, I may have been in a hurry to get them down as valuable minutes were ticking away from CU and CSM, but honestly, I just did not want to wreck their plane. From #81 on up, there were very few teams left in the que and we knew, for sure, CSM would get another attempt. CSM opted for a 1-lap mission 3 because addition laps simply would not improve their score. In fact, Virginia Tech, at #30 in the que and who was destined to finish 2nd overall, elected to do the exact same thing. Additional laps would not have significantly improved their score, but completing mission 3 was crucial. So it was, about 4:45 pm CSM came up. I completed 1 lap and put it right on the centerline. Mission 3 complete and a top 25 finish. CU came up at about 4:50 pm, same plan, same result, 1 successful lap, a perfect landing, and 13th place. As it would turn out, UCLA also got 1 more chance as they were right behind CU at #8. We were still trying to complete mission 1 and came up just short. On the landing, the plane tipped over on its narrow gear and the wing came off its mount, DQ’ing the flight. Cornell came up right behind UCLA at #9, but they didn’t get to go… it was 5:02 pm and the 2018 DBF fly-off was over. I was utterly and completely humbled (and exhausted) this past weekend by several things. First, the incredible enthusiasm, shear tenacity and unwavering determination of the all the teams, but in particular UCLA. Their 2nd to last flight ended in a complete wreck after the motor quit down wind. Yet, they managed to put it all back together for the final try. They could have easily cashed in their chips, but they just wouldn’t quit! Next, this challenged my flying skill and emotional courage to the utmost. Every plane and every situation presented a new challenge and any slight lapse in concentration could end in disaster, and it did on a couple occasions. Granted, most planes were poorly built, underpowered and pushed boundaries. In addition, the conditions were truly miserable. However, the sense of despair I felt after an unsuccessful flight was truly monumental. All the hopes and optimism of a dozen students (after months of sweat and hard work) rests on your shoulders. And, if you fail, those hopes are dashed in an instant. It is tough to shake that off. You want to quit, but you cannot because they refuse to. And, they never place blame or show frustration. They just want to keep trying. I guess that is why I enjoy this so much. You just can’t buy that kind of spirit anywhere! Below are pictures from the event. Needless to say… these 2 teams went home very happy and satisfied. Sleep – get it when you can! Most of you have probably read our recent letter to AMA members, requesting help to protect the Special Rule for Model Aircraft (Section 336). 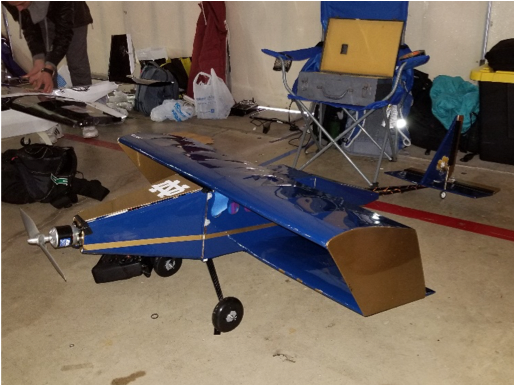 We are requesting our clubs’ assistance to reach as many model aircraft enthusiasts as possible and amplify our message. Congress has begun drafting language to address Section 336. During this process, some are asking for the repeal of Section 336 – which has allowed AMA to manage our members and fly safely and responsibly, as we have for over 80 years. Losing the Special Rule would be an enormous burden for our hobby. There are currently two paths to fly legally in the U.S. – either under Section 336 or under the FAA’s Small UAS Rule (Part 107). If Section 336 is repealed, everyone will have to take an in person test, pay for a remote pilot’s certificate, and fly under Part 107 rules. 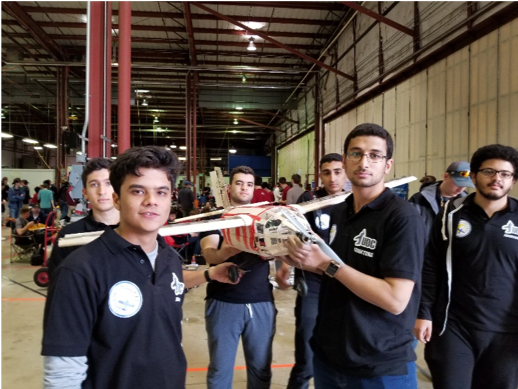 Under Part 107, an individual must be at least 16 years of age to obtain the remote pilot’s certificate, so this path leaves AMA’s 50,000 youth members unable to fly. Share AMA’s Facebook and Twitter posts to contact their legislators. Forward this email (or the original email request) to your club member list, in case our membership records do not contain a person’s most current email address or as a reminder to those that have not yet contacted their representatives. Mention this campaign at the flying site and during your next meeting to your members that may not utilize email or social media. Please ask everyone to click here to send a letter to your elected representatives in support of the Special Rule for Model Aircraft. In addition to sending a letter, you will also have an opportunity to call your representatives. We encourage everyone to take the time for this as well. 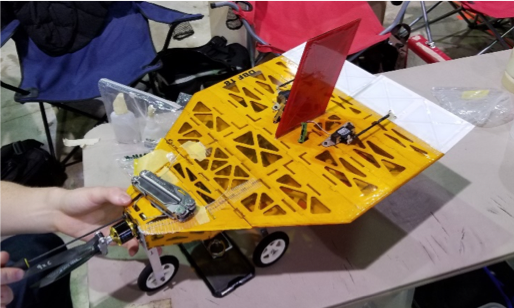 We need your help to demonstrate the value of the Special Rule for Model Aircraft for our community and future generations of hobbyists. 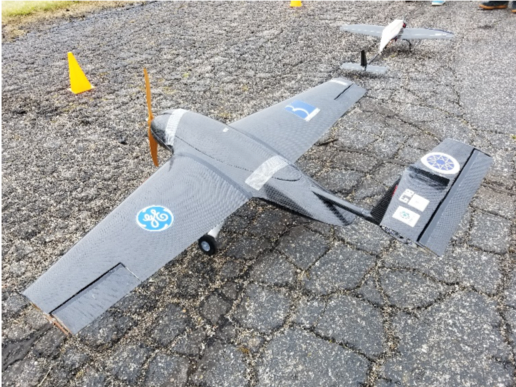 We appreciate your assistance in protecting Section 336 and promoting the safe integration of model aircraft into the national airspace system. I wanted to provide just a brief update about the 2018 project and the going’s on. 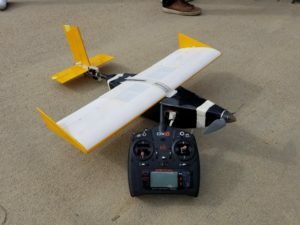 First, what is Design-Build Fly (DBF)? 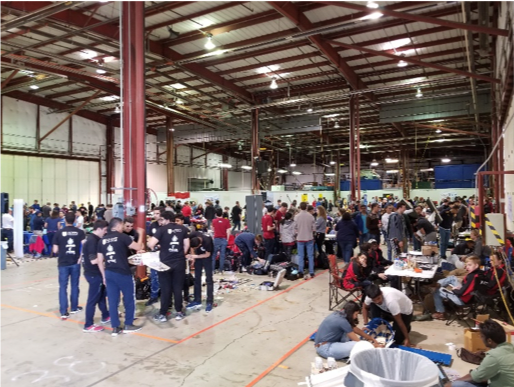 DBF is an annual competition for university students whereby they will design, fabricate, and demonstrate the flight capabilities of an unmanned, electric powered, radio controlled aircraft that can best meet a specified mission profile. The mission profile changes each year, the goal of which is… “balanced design possessing good demonstrated flight handling qualities and practical and affordable manufacturing requirements while providing a high vehicle performance”. The competition also requires a detailed proposal (i.e. report) which is a significant part of the competition score. CU has perennially participated in this event and is both well staffed and funded. I am told that every student in AES (at CU) will, at some point in their academic career, participate in DBF. The faculty advisor for CU DBF is Dr. Donna Gerren. We have assisted other teams in the past from CO School of Mines, North Dakota State University, and Cornell University. I flew for Cornell in 2016 who finished in 8th place that year. This year’s CU team has been very exciting and fun to work with. 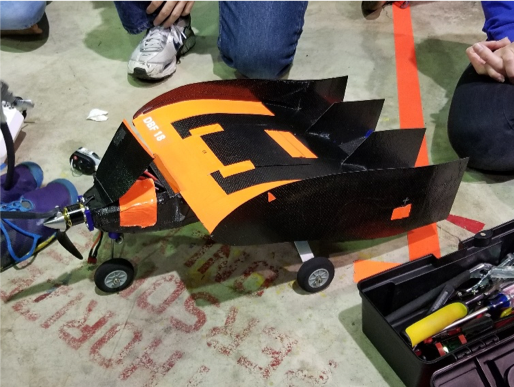 As usual, these very talented and bright students have many great ideas for their vehicle design and are willing to try anything. They also show a very significant commitment to this project despite their rather heavy academic work-load. 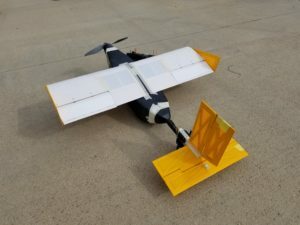 Dan Underkofler and myself have spent numerous hours going over designs, construction techniques (for models) and flight testing. 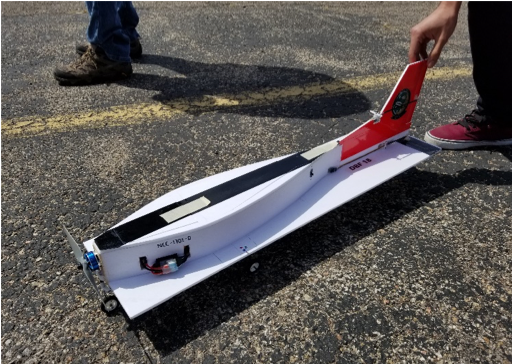 This is the first time that we have had 3 prototypes with which to improve the design, construction and flight characteristics of the vehicle. I’m amazed at how their building skill and proficiency has improved with each new prototype. 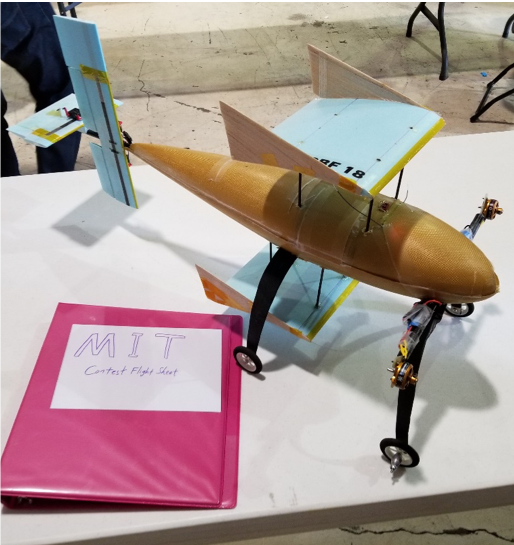 They now have prototypes #2 and #3 which have demonstrated flight and could be used in competition. 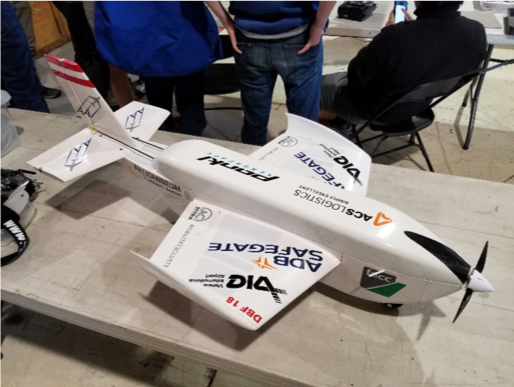 The latest version #3 was flown last weekend (4/7), with great success, and with multiple power and payload configurations. I have the pleasure of being the primary, designated pilot as Dan will be unavailable the weekend of the competition. Thus, we are in the final planning stages. I will meet the team in Wichita on Friday (4/20) morning for a mandatory pilot’s meeting. 3 missions will be completed Friday through Sunday, with the winner being announced Sunday evening. Attached are pictures of prototype #3. This model is only about 24” long with a wing-span about the same dimension. It is powered by either a 7 or 8 cell Nicad battery. It is made with numerous composite materials and many parts were fabricated with a 3D-printer. 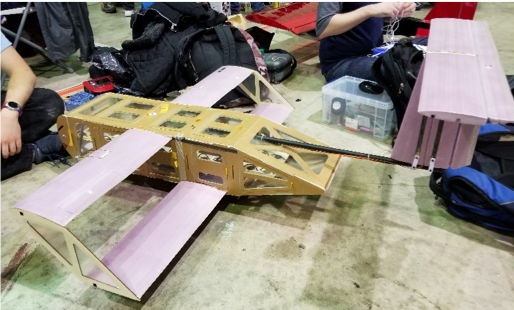 If you look closely, you will also see “laser-cut” balsa and ply components and the gear is machined aluminum. These guys have all the toys at their disposal!!! Speed will be part of the competition, but we have struggled with stability at full throttle. Nevertheless, it does have a fairly wide flight envelope, will fly very fast, and is manageable to take off and land. We are able to complete a “lap” which consists of 500’ upwind pass, 1000’ downwind pass including 360 degree circle back at center, then 500’ back upwind in about 30 seconds. One mission will be to complete as many laps as possible within 10 minutes, with a successful landing. 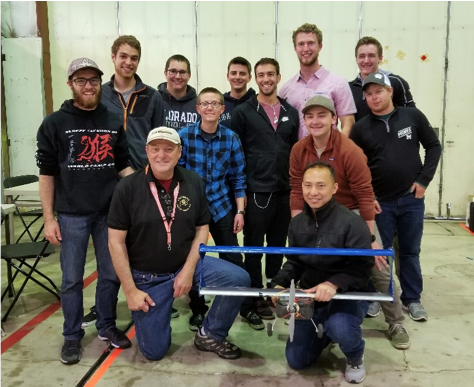 During our March General Meeting, Scott Covey gave a presentation on how to setup your plane and trim it for straight and level flight. These tips are invaluable as the better your aircraft flies, the more fun you can have. You can view the slides here. This video was shot by Mark Howard using an FPV Quad on November 20, 2017 showcasing some of our members and facility. Another beautiful day at the AAM Airpark. 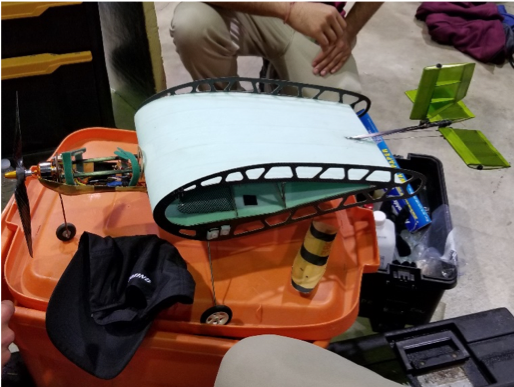 During our October General Meeting, Lee Jay Fingersh gave a presentation on how the Prius Prime works from a battery perspective and how that relates to our LiPo flight packs. You can view the slides here.